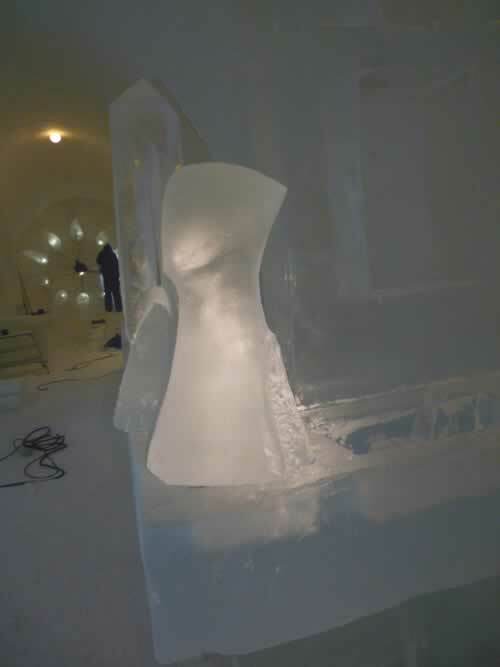 So here we are at the Ice Hotel in Kemi Finland. I’m one of the lucky ones as I’ve so far spent all my time inside my snow tunnel sheltered from the wind. Juha came by yesterday and complained that he had frostbite on his cheek from the wind as he’s been working outside most of the time. I just laughed but then offered my balaclava as a concerned after thought; he declined being a macho Finn. There is a lot of testosterone here, it is all men and everyone is yielding a chainsaw or some other sort of dangerous machine. The guys with the large chainsaws look pretty cool, but I think it must be the huge digger that has the final say, I would not want to mess with that. When we are walking around the site we have to wear a flashing head torch so that they can see us. There is one machine that is particularly daunting, this is the tractor that has a rotovator on the front, which churns up the snow and then spits it out onto the forms to make the snow walls. We were joking earlier in the sauna that if you got caught up in that your flashing head torch could be mistaken for a shooting star; quite a spectacular final farewell. I’ve so far made a poster and a printing press and was today with my old friend Sergey from Russia who is making a Sibelius scene. Tomorrow I am in the snooker room making a bit of furniture. In the making of the hotel there is the construction team with the big machines and ideas, and then there is our small team of six who are like interior designers. We help make it look pretty. Until tomorrow.